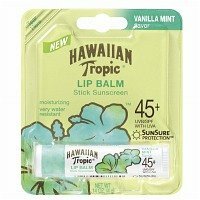 A touch of Hawaiian tropical exotic, natural flora, and fruit extracts…hydrate your lips with our improved moisture burst sun protection. Formulated with our new SunSure® Protection, less chemical sunscreens are used to achieve a higher SPF with longer lasting protection! Water Resistant and Paba Free. Recommended by the Skin Cancer Foundation.